Apple also includes the adapter in the box with the iPhone 8, iPhone 8 Plus, and iPhone X, but more evidence has emerged today that suggests that trend will soon end. Cirrus Logic, a supplier for the adapter, has apparently "confirmed" that the dongle won't be bundled with Apple's widely rumored trio of new iPhones expected next month, according to a Barclays research note. Apple routinely says it is pushing towards a "truly wireless future," and the headphone jack adapter has always been a stopgap amid that transition, so if Apple chooses not to include it in the box, it shouldn't really come as a surprise. Rumors suggest new iPads will also lose the headphone jack and adapter. Not everyone prefers wireless headphones, like AirPods, however, so if true, the removal of the adapter will almost certainly generate some controversy. Apple will likely continue to sell the adapter as a standalone accessory for $9, which is cheap by its standards, so customers at least won't be forced to pay too much extra for the adapter if it is indeed removed from the box this year. The adapter is also available at resellers such as Best Buy, where nearly two years later, it is the retailer's second-best selling Apple product in terms of units, so an argument could be made that Apple is removing the adapter too soon. In a little over a month, we should find out for sure. Really not a big deal. Most never use headphones with their phones anyways. I have a pile of these things sitting around, along with all the chargers and headphones from previous phones and test phones. Not all that useful. Reference the Bolded: I think that’s a heavily lopsided opinion, as many still do use Wired headphones with smart phones today, even though Bluetooth has grown exponentially. With AirPods I don't know where mine is. They don’t have to sell them. Provide one free one per serial number or something. Like many have said, mine from the X is still sitting in the box, so that’s definitively a waste of money, but for those that want it, provide it for free. Why Should Apple have to give anything ‘free’, let alone some wireless headphones? 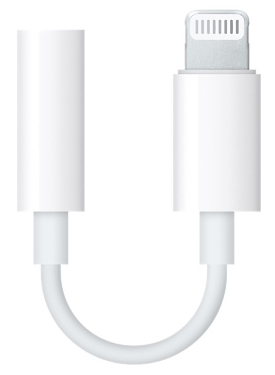 Because they deleted a 3.5 mm Jack or are no longer including the lightning adapter? I don’t understand why you think Apple should do something for free because of what exactly? Are you seriously defending a now Trillion dollar company with massive profit margins? It probably costs them pennies to include the adapters in the package of the phone people are paying well over $1000 for. It’s not free, it’s built into the cost of the phone. My family switched to bluetooth five years ago and never looked back. I can imagine some of the audiophile purists thinking of something snarky to say after finding out this was inevitable. I still have a 6S and while I like the headphone jack option, even I've moved on to wireless headphones. I'm happy with my hifi stuff staying at home I guess. The upside is now I have no cables to snag on things.